Do you ever want to find a DIY craft that you can make while watching your favorite show? well, this is that project. We made these Easy DIY Bracelets and they’re perfect to pair with any outfit. They’re completely customizable and way easier than you think to create. We only made three but you can make as many as you want. 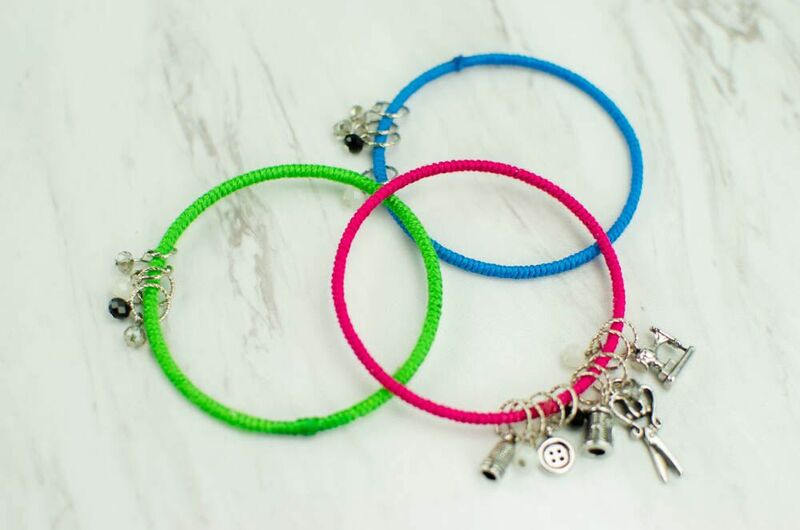 We also added charms to ours but you could keep it simple and just wear them as bangles with no charms. These were fun to make and great to mindlessly work on while binging Gilmore Girls. I hope you stick around to read how you can make your own DIY Bangles. Start by adding a dab of glue to one of your bangles and attaching the end of your string to the glue. Repeat on all of your bangles and allow them to dry. Once the glue has dried you have the long task of wrapping the string around the bangles. This is the part where it’s great to wrap these while watching a favorite show. Once you’re finished wrapping your bangles cut the end with scissors and add another dab of glue to keep the string in place. Repeat the process with your other bangles. Take your jump rings and add your charms and fasten them together onto your bangles with pliers. Add as many charms as you want or add none at all. I love how these bracelets turned out. I think they look great with and without charms. You can make tons of these in every color to be able to match all of your outfits. These would be perfect to make at a party, too!